The Komodo dragons were first documented by Europeans in 1910, when rumours of a "land crocodile" reached the Dutch colonial administration of Indonesia. The first two live Komodo dragons to arrive in Europe were exhibited in the Reptile House at London Zoo when it opened in 1927. The animal is the world's largest living lizard, can reach 3m or more in length and weighs more than 70kg. In 1986, Komodo National Park was declared a World Heritage Site. It covers 390sq km and has a population of around 2,000. Ships moor offshore, then it's a short distance to a pier where a "gateway" centre is being built. Native guides were provided and while the reptiles' normal habitat was not that far from the landing stage, we went on a roundabout route to find them. The other curiosity of the island is a beach with "pink" sand, one of only seven in the world. It must be said that Bali, supposedly one of the great holiday centres of the world, was a disappointment. We moored well offshore, the single passenger pier taken up by another cruise ship. Even on eventual arrival, there was no proper information bureau and it had been impossible to pick up any material in London. Our aim was to see just a little of the heritage of the place, perhaps take lunch at a 5-star hotel, of which there were reputed to be many, and spend the afternoon at the beach. Some initiative is needed by the Bali resort marketing people towards the cruise lines. The hotels would certainly pick up some passengers wanting a day out and happy to spend dollars. Charge a few dollars for the bus ride and use of the facilities, and the bars and restaurants would prosper too. As it was, we booked the “Discover Bali” tour, which took us to the inevitable local artwork shop visit, a temple and the Bali Bird Park. It was the bird park that saved the day. It is about 10 miles from Denpasar, the capital of the island. Covering about half an acre, the complex houses more than 1,000 birds representing more than 250 species, mostly in aviaries but with some non-flyers free to roam on a site that includes three large lakes. 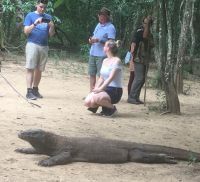 If your cruise is northbound, as ours was, in some ways you will be disappointed to see Komodo dragons again close up from a safe bridge overlooking the pen. You have to question whether seeing the reptiles in their natural habitat is worth it. 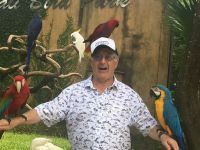 The bird park also features a diverse botanical collection including 52 different species of palms, rare jungle fruit trees, cycads, bamboos and cactus. There are various shows and activities throughout the day, including both Lory (a type of parrot) and pelican feeding. There is an animal hospital with experts around to explain. All the staff were very friendly. 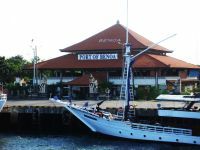 Sited on the north coast of Java, Semarang was the last port of call in an 18-day journey. Semarang was a stepping stone for Sir Stamford Raffles, who was lieutenant-governor of the island on his way to found Singapore. The Semesta Heritage Hotel is on the site of his former home. The capital of central Java was a major railway town during the Dutch colonial era, and still is an important regional centre and port today, with a population of 1.8m. Trains connect Semarang to Jakarta (6hr) and the city has an international airport with mainly domestic services but also flights to Singapore and Kuala Lumpur. We took the “highlights” tour but for many others a ride on a steam train proved a bigger attraction. We visited the restored former railway company’s imposing head office complex, and also the Great Mosque of Central Java, in its own way just as impressive. The Chinese influence is everywhere and the famous admiral Zheng He was reputed to have come this way in the 15th century. Sam Poo Kong Temple is Semarang’s largest Chinese temple complex encompassing a handful of large colourful tiered pagodas facing an open courtyard. What might have been anti-climactic turned out to be a fitting finale to a most enjoyable trip.